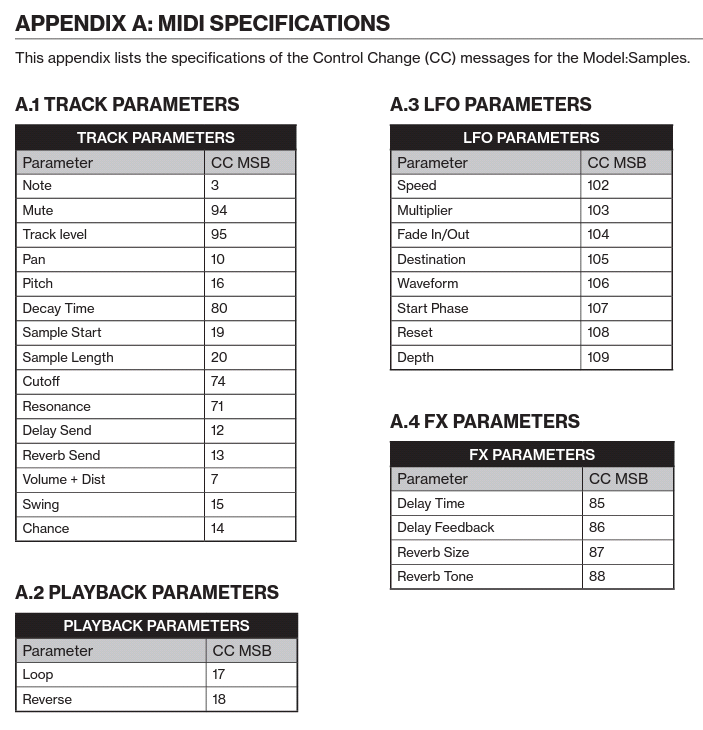 Hello, I was wondering if the sequencer in the Model:Samples send all the midi informations recorded, including motion sequence, or do the knobs send midi out information? Thanks. Tracks with Midi Out checked send notes only (with velocity). No control changes sequencing. Thanks! I have actually download the manual now. I thought the midi chart will come at a later date, but I can see from the what you kindly sent me that all the informations are already there, even if a little bit spread all over! I always like the Elektron sequencers, so I’m looking at this unit more as a very well implemented hardware sequencer, more than anything. I think it can also send cv of some sort trough the midi port used without the adaptor. Well I need more informations, but there is time since is not really available yet. Thanks again. Thank you for highlighting this in red as a fair warning. I thought I might be able to use an M:S for external MIDI sequencing, but nope. It doesn’t meet my particular CC needs. There’s Elektron magic inside, but only in trace elements. Oh well. 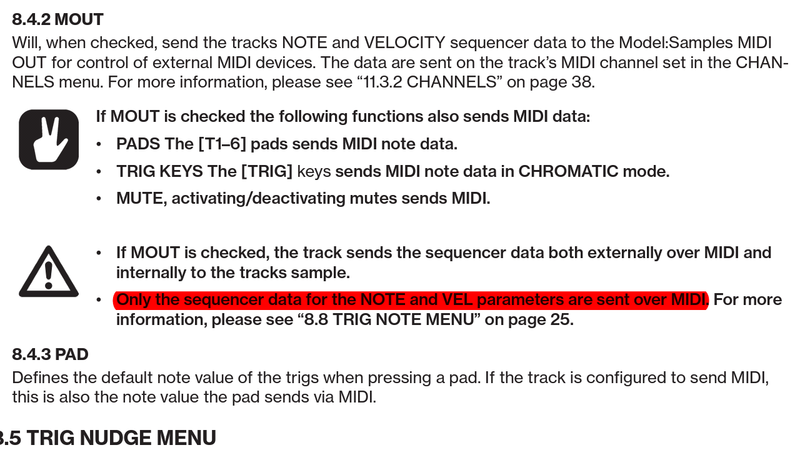 so the m:s will send sequenced note and velocity data but not other cc’s. but it will send other cc’s via the knobs, just not sequenced ,correct? Velocity is included in a note message. Velocity with 0 value correspond to a note off. Apparently 1 type of midi message : Note On. As it is possible to filter knobs midi data I guess it is possible to send them. 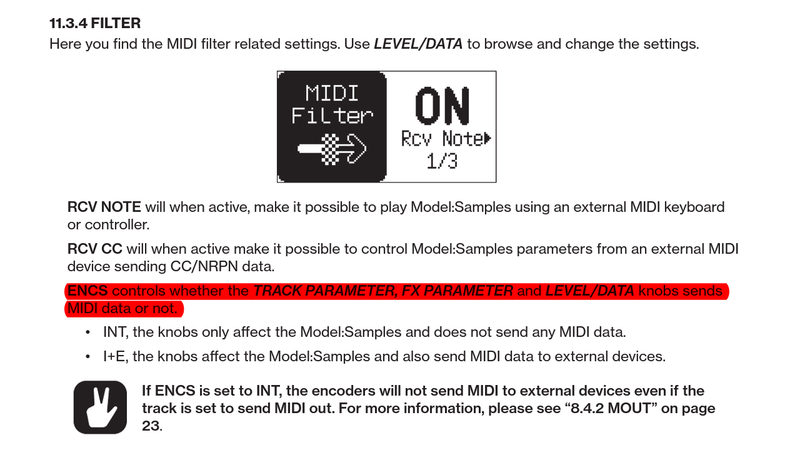 I suppose midi data is Control Changes. Sorry to come back to this conversation after so long, but I’m trying to make some sense of all of it. So, recorded sequence will only send note and velocity. And of course note and velocity are sent in play mode. Meaning that in both cases you can record this data in a DAW. Perfect. Plus, with the ENCS option ON, which means the knobs work as encoders, you are sending midi data out produced by the encoders you are twisting in real time. Meaning, I think, that you can record in realtime in a linear way, let’s say a performance in your DAW, adjust it, playing it back to the model, and multitrack the model in your DAW and then work on the audio tracks. Or you can assign the notes to a Drum Kit or any other VST in your DAW and then in realtime play the Model sending all the changes! What you CAN’T do, fair enough, is record a performance in the Model internal sequencer, with trig condition, and so on, and then record to your DAW, because the Model, for whatever reason, that I don’t know, it is not able to do that. Annoying, but if ispiration comes away from a PC, then you have to multitrack and work with audio later. Or, have a midi app handy and record what are you doing. Does all this makes sense to anybody, please? Thank You.